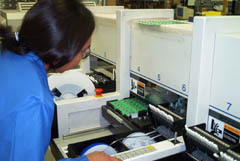 Connect Tech offers a complete range of manufacturing services, from board assembly using Surface Mount and Through-hole techniques, to complete product manufacturing. We have high-speed equipment that decreases lead time, lowers cost and delivers excellent quality. We have extensive experience in developing test equipment, and typically test all products going out so that we can guarantee 100% of the product shipped is good. This high-speed assembly machine can perform electrical test on the parts as it places them. Products manufactured by Connect Tech can be built with components you supply, or we can obtain them for you. Our inventory contains over 2 million parts in stock to provide faster service, and we have a purchasing department that has extensive contacts both in the United States and offshore to get the best available pricing. Connect Tech can offer turnaround on small volumes as fast as 24 hours using our PRONTO service. Please contact us for more details. In order to better serve our customers, Connect Tech also conveniently offers other services such as retail packaging, shrink wrapping, and order fulfillment.